Features an offset ergonomic handle. Expertly honed convex edges feature anti-push edges for superior cutting performance. Please Try Washi MYA Silver Sky Matching Set. MARKED DOWN, SAVE $100. 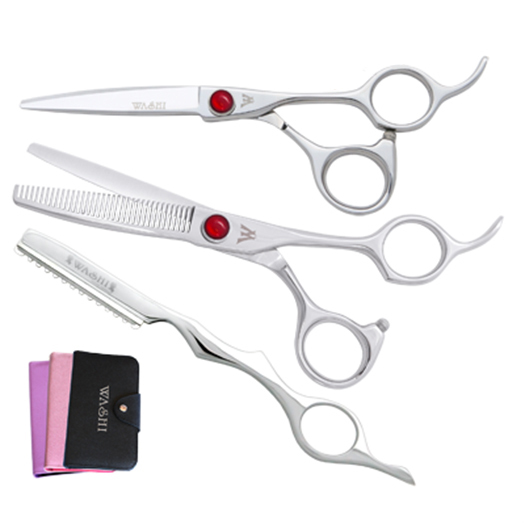 This shear/thinner combo features an offset ergonomic handle designed to open the hand. This creates a wider grip to give you better control. Expertly honed convex edges feature anti-push edges for superior cutting performance. Set comes with a Texture razor and a 5-pc case.